It’s the first question most people ask about my tours in Latin America. Of course, what they mean is, did anything bad happen? They want to hear stories of being robbed, assaulted, arrested; anything that confirms their suspicions of all those dangerous countries down there. Sorry, but I refuse to feed fantasies of a lawless Latin America filled with nothing but drug cartels, corrupt governments, poisonous snakes, disasters, and disease. That’s not the Latin America I know. So, what are the legitimate dangers? Before answering that question, let’s reject some popular misconceptions – distorted fears people have about bike touring in “dangerous” Latin America. If you’re going to be fearful, at least give your fears some sense of scale. 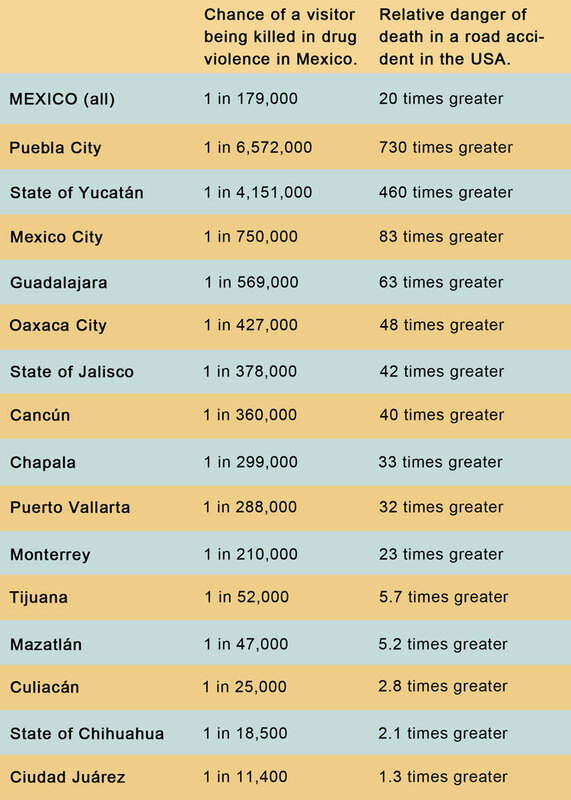 Source: geo-Mexico.com (click to enlarge). 1. Run-ins with drug cartels in Mexico. This is the number-one concern of people who know little or nothing about Latin America. And it’s a bit ridiculous. The idea that a sweaty budget-traveller pedalling along the side of the road is of any interest to a drug cartel whose lowest-ranking members earn more in a week than I spend in half a year of touring is absurd. Unless you’re a rival gang member, a Mexican cop, or a local journalist who writes articles denouncing drug lords you should not be worried about this. 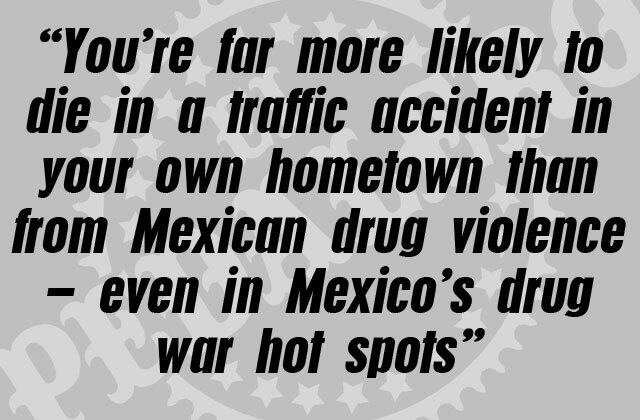 True, there have been rare instances of very unlucky tourists caught in the crossfire, but statistically, you’re far more likely to die in a traffic accident in your own hometown than from Mexican drug violence – even in Mexico’s drug-war hot spots (see insert). 2. Getting kidnapped by armed groups in Colombia. This used to be the number one concern until about seven years ago, when the media suddenly became more interested in Mexican drug cartels. Again, it’s ridiculous to think that a bicycle tourist is a target for the FARC, the ELN, or the AUC. 3. Being murdered/stabbed/raped. All nasty crimes, yes, and all avoidable with very little effort. Chances are, your own city has a higher rate of violent crime than ninety percent of the places you’ll be visiting – even the poorest places. It’s false to assume that people are less moral because they’re poor. While it’s true that Latin America has some dangerous slums it’s also true that the disproportionately high crime rate in these areas skews the average for the entire continent. Here’s an idea: stay away from dangerous slums. 4. Being attacked by an animal. Rabid dogs seem to be the animal that people fear most. Snakes are probably next. After that, it’s a whole maligned menagerie of scorpions, piranhas, large spiders, urethra-invading fish, and other hapless critters. But it’s foolish to fear these creatures. Simply be aware of them, give them some space, and remember that they’re not out to get you. They simply go about their business and keep a low profile. Well, not the dogs perhaps, but very few are rabid. Dogs are more of a nuisance than a danger. 5. Receiving improper or unhygienic medical treatment. This one makes me angry because it borders on racist. I’ll never forget a consultation I had with a Canadian dentist who, upon hearing of my plan to receive a follow-up with a dentist in Central America, immediately launched into a rant about how their dental clinics were dirty (he even mimed licking a dental tool). Unsurprisingly, he’d never even been to Central America. Let me make this clear: I have visited dentists and doctors all over Latin America and have always received excellent care. The clinics and hospitals were always clean and the staff were always courteous and competent. The fact that Latin America’s dentists and doctors aren’t overpaid doesn’t make them any less professional. There’s no need to ruin your trip worrying over every potential danger. 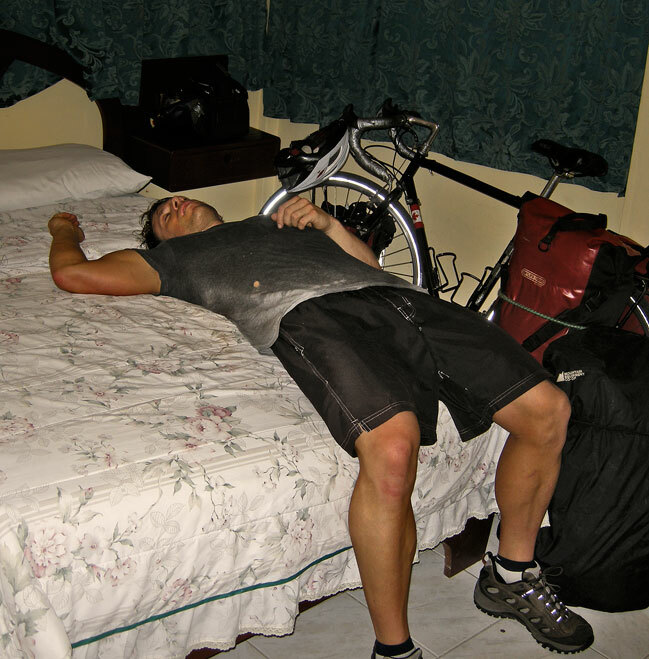 The dangers that exist in your daily life back home (heart disease, cancer, falling pianos) will also exist in on your bike tour of Latin America and you already live with these “dangers” worry free. There is, however, one legitimate danger that should never be far from your mind as you ride: bad drivers. If there’s one potential danger associated with bicycle touring, it’s bad drivers. No other danger even comes close to the body count caused by traffic accidents. If, after all I’ve said, you persist on obsessing over danger, then at least make it this one – bad drivers are a serious menace. There is a lonely, narrow cliff-hugging dirt road in Bolivia known as the World’s Most Dangerous Road. It isn’t. Sure, it’s scary looking, but that’s not what makes a road dangerous. 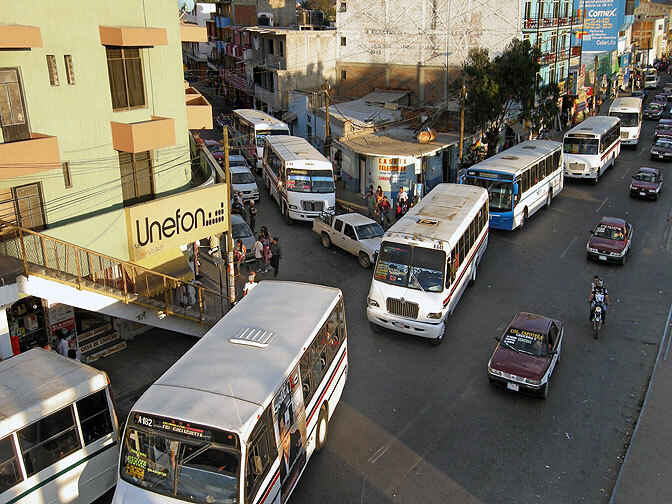 The most dangerous roads are busy highways like Mexico’s Pacific Coast Highway north of Acapulco, where drunk, speeding, sleep-deprived drivers battle for road space without regard for their safety or anyone else’s. I’ve seen the aftermath of some horrific accidents on these roads. Talk to locals to find out which roads are dangerous beforehand and either avoid them completely or ride them with caution (wear your helmet and shoulder-check frequently). If you find yourself stuck on a dangerous road, hitch a ride with the next pickup truck. And avoid riding after dark. Cars drive with their headlights off at night in many areas. The following scenarios should not preoccupy you, but they are worth consideration. Falling off your bike. This hasn’t happened to me, but I’ve met cyclists who have crashed their touring bikes and had to hitch to the nearest hospital with their broken collarbones, arms, wrists, etc. Extra momentum makes crashing on a loaded touring bike worse than on a regular bike. In parts of the Andes, you can descend for a hundred kilometres in one go – which is fun – but before enjoying that big descent check your brakes and put your helmet on. Stay alert for potholes, stray dogs, children, and landslides as you go. Treating myself to some air con after seriously overdoing it in the Dominican Republic. Heat exhaustion has a way of sneaking up on you. Contracting a parasite. Parasites have the potential to end your trip and ruin your health – and they’re easier to contract than you might think. It took me three years to rid my body of a giardia infection I picked up in the Amazon. Only drink purified water, even in reportedly pristine areas. When buying street food, try to assess the hygiene standards of the vendor. How is it being prepared and how long has it been sitting out? Don’t get into the habit of walking around barefoot. There are parasites capable of infecting you through the soles of your spongy first-world feet. Sunburns, sunstroke (heat exhaustion). Symptoms include headaches, nausea, cold or clammy skin, loss of colour, severe fatigue, loss of appetite, cramping, and collapse. Try to avoid riding during the hottest hours of the day and use sunscreen when you’re stuck in direct sunlight for long periods. Heat exhaustion can sneak up on you so drink plenty of water and take regular breaks in the shade. In areas of low traffic a cheap straw hat will protect you more than a helmet. The hottest area I’ve toured (with daytime highs reaching 43ºC/109ºF) was the Paraguayan Chaco. Central America’s lowlands also tested me with steady, intense heat. But even in relatively-cool Patagonia I was getting sunburns through my shirt – the sun is more intense in the southern hemisphere. Animals aren’t out to get you (not even snakes). Don’t fear them, but be aware of them. Snakebites and insect/arachnid bites or stings. While I maintain that animals aren’t inherently dangerous, it’s worthwhile taking precautions to avoid antagonizing them. If it rains at night while you camp you may unintentionally create an attractive dry spot for a snake. Poke the corners of your tent with a stick each morning to see if a slithery friend has coiled up underneath during the night. Likewise, make a habit of shaking your shoes before putting them on to see if a scorpion falls out. Less dangerous but far more common (and annoying) are all the ants, horseflies, blackflies, sandflies, and mosquitoes that make camping a challenge in some areas. Speaking of mosquitoes, malaria is another great fear of travellers in Latin America. Be aware that the prophylactic (preventative) drugs used in anticipation of a malarial infection often come with serious side effects (photosensitivity, nausea, hallucinations, nightmares, panic attacks, depression, and even psychosis). Only use these drugs if you’re certain you’re in an area of recent malarial outbreak (there aren’t many) and you don’t think you can avoid being bitten. Tourist hotspots. As a cyclist travelling independently you can avoid places where thieves target tourists (resort towns, famous sites, bus terminals) and instead travel in calm, crime-free areas where locals are friendly to foreigners. That’s not to say you shouldn’t visit Machu Picchu, Atitlán, Titicaca, et cetera, but approach these tourist hotspots with the understanding that they attract muggers, pickpockets, and scam artists who won’t hesitate to rob anyone they perceive as wealthy, naïve, or easy to intimidate. Here again, cyclists have an advantage over regular tourists as most of us come across as the opposite (low-budget, wary, and confident) and not worth the effort. In the case of muggings, most guidebooks recommend you hand over everything. I don’t think this is always the best advice, however, because it creates a climate of opportunity for thieves who can’t believe how easy it is to frighten foreigners. Plus, if a thief were willing to kill you for your money or stuff, it’s unlikely you’d even see him coming. The fact that he approached you face to face probably means he has no intention of killing you. You have options. You can run (no thief wants to be seen chasing a tourist through public areas brandishing an open blade). You can yell and make a scene (again, very uncomfortable for a thief). When a mugger pulled a knife on me in Cartagena, I pulled out my Swiss Army knife and told him I was going to kill him. He immediately turned and ran. I realize this strategy is not for everybody, but remember to keep things in perspective. Thieves are lazy; they don’t want to work too hard to get your money – in fact, they don’t want to work at all, which is why they’re thieves. 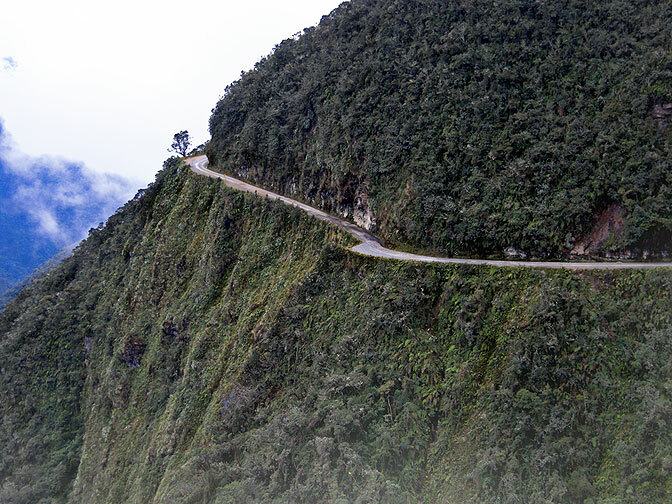 The so-called “World’s Most Dangerous Road” is spectacular, almost traffic free, and as it turns out, not really that dangerous. I suppose my message is this: keep it in perspective. Colombians ask me if anything “happened” while I was in Venezuela and Venezuelans ask me if anything “happened” while I was in Colombia. Chile mistrusts Argentina, Peru mistrusts Bolivia, city folk mistrust campesinos, and vice versa in all instances. No one trusts anyone, it seems. And there’s always a market for danger. 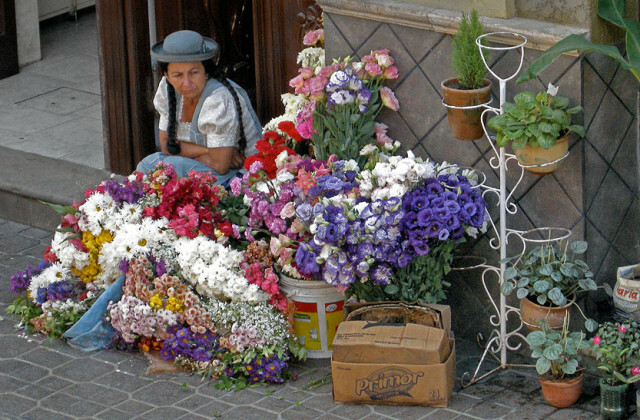 Feature image (top of page): Flowers for sale in Bolivia – one of the many “dangers” foreigners face in Latin America. Thanks for the useful info! Was wondering ur thoughts on a lone female cyclist in Latin america. I really want to head out on an adventure there but finding it difficult to convince anyone to go with. do u think it would be foolish to go alone? Great article! It is funny how you mention that people mistrust their neighbouring countrymen…I’ve heard that before from backpackers in Africa…every country they visited was safe and full of wonderful people… “But, watch out for those people over there, because they are murderers and thieves!”. Haha. We are preparing a tour in South America for next year (2014) and many people warn us about the “dangers” of this destination! So your article is really reassuring! Your whole blog is a fantastic resource for us: so many useful tips about each country! Our only “problem” I would say is where and when to begin…so many choices!!! (I just read your article about that too.) We will have 18 months so I guess it will be possible to see plenty. We will continue to look at your blog with great interest! Wow, 18 months – fantastic! With that amount of time you can comfortably explore all corners of the continent. be sure to check back with El Pedalero in 2014 and give us an update from your trip. And thanks for leaving a comment; I’m happy to hear you’re finding the site useful. This is such a great site. Like seriously. I am an empath so sometimes other peoples’ concerns and fears of me traveling thru Latin America can really affect me. But just like with every bike ride, I am still pedaling on and planning my journey to Brazil for the World Cup. It’s called One Love Ride. Thank you El Pedalero. Cheers! Thanks for that Jhessye! And thanks for dropping by El Pedalero! I’ve enjoyed seeing your “One Love Ride” progress through the Latin American continent. It’s always great to see passionate people such as yourself chasing (pedalling) after their dreams! Great article. I remember flying into Bogota with great trepidation and expecting chaos. I put my bike together at the airport and could have not felt more safe as I pedaled away on one of the city’s great ciclorutas. After a month of touring my only bad memories were of sprinting away from dogs. Yes, I had the same experience biking on Bogota’s excellent, separated, paved bike paths. Everyone is friendly and helpful when you ask for directions and people always stop to help when you get a mechanical problem with the bike. Such a good experience! (Well, apart from the dogs). Thanks for dropping by El Pedalero! 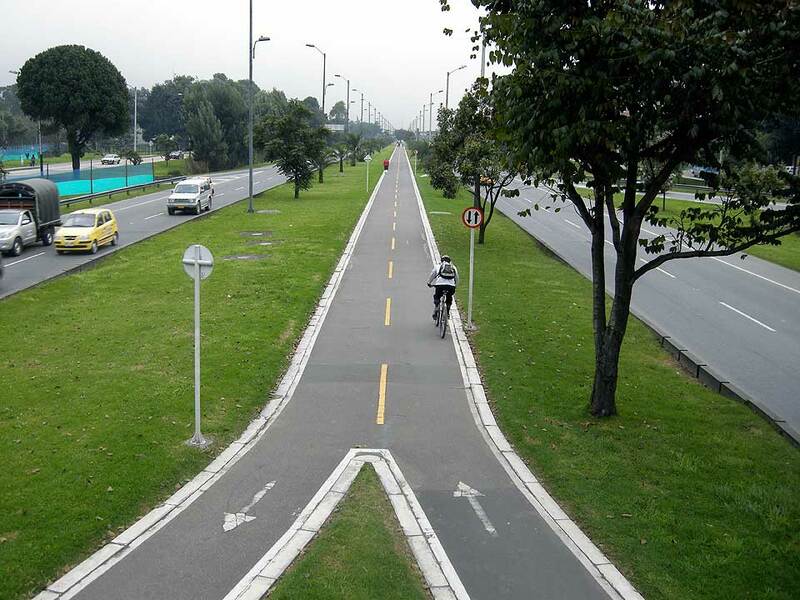 I snapped this shot of a section of Bogota’s bike path network in 2009. Totally separated from the main road, all paved, painted, signed – basically, awesome! 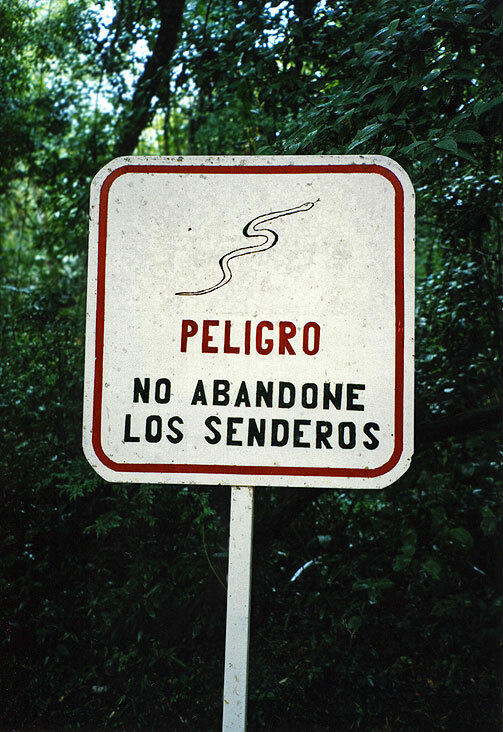 Yes, Latin America’s back roads are the best. This is why travelling by bike is so good – you can control risk better. When you’re on a bus, you’re at the mercy of the driver and the bus route. I find that much scarier than biking. Grr, dogs . . . ! I absolutely agree with everything you said, apart from one thing: If you’re being mugged, DO give everything the thief wants. Do NOT hesitate to give it all. Ever. At least in Venezuela, where I come from, it’s general knowledge that you have to do this. In fact, pretty much everyone who gets killed while being mugged is because they resisted it. And I know this is true in other neighboring countries. That said, as you pointed out, this is extremely rare. I come from the 3rd largest city (Valencia, one of the most dangerous) and I was never, ever mugged, and neither have my close relatives as far as I remember. Only a small number of acquaintances have, though. Thanks for dropping by El Pedalero; it’s always nice to hear from nuestros hermanos venezolanos! OK, your point is fair, and I will concede that if someone is mugging you at gunpoint, bad things can happen. But I disagree that you always have to give everything no matter what. I have been mugged three times in Latin America and every time I was able to scare the would-be muggers away (in Colombia, Guatemala, and Peru). As for your statistic that everyone gets killed because they resisted, well, it’s simply not possible to prove. Again, I do agree that in a secluded place at gunpoint it could happen and I’m sure it has and does. But I know many travellers like myself who have intimidated muggers and saved themselves from being robbed. I think the problem is that people assume they have no option but to allow themselves to be victimized; they see the knife and immediately go into shock. Then they beat themselves up afterwards for giving in too easily. And in the end they adopt an attitude about Latin Americans being dishonest. It’s sad, and I’ve seen it many, many times. Anyway, my main point in the article is that travellers who constantly obsess over security and mistrust the locals wherever they go always seem to ruin their trip. And they miss out on getting to know the amazing, generous, hard-working Latin Americans who comprise 99.99% of Latin America. As for Venezuela, I have cycled right around that beautiful country without incident! In fact, once at a cafe in Merida, I stupidly dropped a wad of cash out of my back pocket and left without noticing. As I was walking down the street two blocks away, a woman came running up behind me holding my money out for me because she saw me drop it! I often tell this story to remind people that not everyone is out to rob you in Latin America. Mostly, people are good and they want to help. Thanks again for your input, Gustavo! As you may have noticed, my statement about the consequences of resisting to being mugged was very subjective. I didn’t know about any statistics about the subject when I wrote the original post, and it was my perception based on what I read in the news. I’ve done a quick research and, according to one source*, resisting to being mugged is the 2nd cause of murderers in my country with 13% of cases. (The first cause being gangsters killing each other with 71% of murderers). Other sources roughly match these numbers. As frightening as these numbers may sound, I agree that the risks for cyclists are low (crime-wise) as long as they avoid the big cities, or at the very least stay away from the slums that surround the big cities. Your statement “the disproportionately high crime rate in these areas [dangerous slums] skews the average for the entire continent” is spot on. I’m glad to hear about the experience you’ve had in my country. People in the countryside are lovely generally, and Andeans in particular have a reputation for being polite and helpful. By the way, I love your blog! I started following it last month and I’m now eager to cycle around Venezuela in my future visits (I live in Europe). I also think it’s worth mentioning that many of Latin America’s problems stem from a history (both recent and from colonial times) of exploitation and inequality and that North American and European countries share much of the blame for this situation. Let us know if you do a bike tour around Venezuela! I love it when I see cyclists exploring that overlooked corner of Latin America! Agreed, and will definitely let you know when I do it. Fantastic article; sounds as though it’s much needed. Did you take another trip recently? Thanks, Kate! 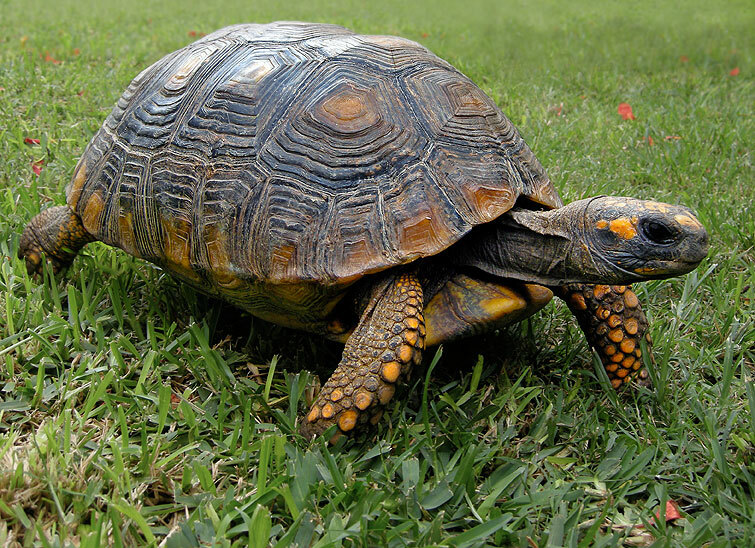 Yes, I got back from a quickie in March in Mexico – Oaxaca State. Another “big one” is in the works, though!